El T30D1 es una evolución del T29, que se desarrolló a la vez que este. Los prototipos se probaron hasta 1948, pero el tanque nunca se produjo en serie. The T30 has a long history in World of Tanks. It started as a very good above average performing Tier X Heavy tank, that after several consecutive nerfs, ended at the back of the caravan. Its transformation into a Tier IX tank destroyer made this tank once again very enjoyable to play. Its main weapon, the 155 mm T7, was formidable already in the Tier X arena, but when used against Tier VIII and Tier IX targets, "devastation" is the only word that comes to mind. However, the T30 has a very weak hull, and under no circumstances can it afford to ignore low tier opponents. In the hands of a skillful player that knows how to properly use its strong points, the T30 can face any tank in-game and single-handedly change the course of the entire battle. The T30 is quite a nasty tank to fight as it mounts the powerful 155 mm AT Gun T7, the same gun as the T95. The T30 can be quite scary to fight alone, especially if it manages to ambush you. Its slow turret traverse speed may allow close tanks to flank and avoid getting hit by the T30's massive gun. T30 drivers can attempt to counter this by turning the entire tank towards the target to bring the turret around faster. The best way to defeat it is to just gang up on it and strike at the hull armor. Fighting the T30 when it's in hull down is even more difficult. In this situation you may have to attack from multiple sides simultaneously. The T30 is similar to a tier X heavy tank with super low hit points and a massive gun, so you may play like it was before. With the super weak hull and super strong turret in mind, hull down positioning is perfect if you find terrain for it. A tier X TD is about the only thing that can penetrate through your turret. Other snipers will aim for your Commander's cupola behind the turret. Artillery can hit your hull and the side/top of your turret, dealing heavy damage. Use the T30 carefully, and it can lead your team to victory in many situations. The 120 mm is somewhat viable due to its superior DPM and chance to catch enemies that are expecting you to have a long reload offguard, but the 155 mm is superior due to requiring less exposure to deal damage. Note also that as a tank with 360 degrees of turret traverse, the T30 can use traditional TD camo bonuses for sitting still without breaking them if it is able to track targets without moving the hull. If playing hull-down however sitting still isn't recommended, as moving between shots makes sniping your commander's cupola much more difficult. With practice, you can tempt your opposition to fire at your turret, providing you with increased safety to take the time to aim your next shot. The 120 mm gun carries over from the T28 Prototype. Install it immediately, as the stock 105 is inadequate. The top radio is also available on the T28 Prototype. Next, the stock suspension cannot hold the 155 mm, and you can't mount much equipment with it either. Get the top suspension. Then get the 155 mm cannon to bring the 750 alpha that opponents fear. Finally, get the top engine for a little bit better mobility. Some players elect to use enhanced suspension if they want to prioritize researching the 155 mm or already have it available. By the middle of 1944, combat reports from Europe describing the use of heavy tanks by the Germans stimulated new interest in the development of an equivalent American vehicle. The Pershing medium tank provided an answer to the early model of the German Pz.Kpfw. VI Tiger. However, although the latter was still in first line service, it had first been encountered by U. S. Army during 1943. By 1944, the Germans were introducing even more heavily armed and armored vehicles (Pz.Kpfw. Tiger II). 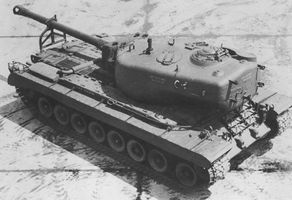 Although for morale purposes the M26 Pershing was temporarily redesignated as a heavy tank, it clearly did not provide an answer to the problem. On 14 September 1944, U. S. forces recommended development and manufacture of four prototypes for a new heavy tank. Two of these were designated as the heavy tank T29 and were to be armed with the 105mm gun T5E1. The remaining two were designated as the heavy tank T30 and were to be armed with the 155mm gun T7. Two T30 heavy tanks entered the test program at Aberdeen shortly after the T29. The first arrived at the Proving Ground in April 1948, followed by the second in July. Originally intended to have the same power train as the T29, the military characteristics of the T30 were changed in late 1945 to substitute the air-cooled Continental V-12 engine for the liquid- cooled Ford GAC. The new engine, designated as the AV-1790-3, developed 810 gross horsepower at 2800 rpm and was an early model of what became the standard power plant for American tanks during the next decade. The main objective of the T30 test program at Aberdeen was to evaluate the new engine with the CD-850 cross-drive transmission. The T30 hull was essentially the same as that of the T29, except for the changes to the engine compartment necessary to accommodate the air-cooled engine. The turret was also similar to that on the T29, but was armed with the T7 155mm gun. Only one coaxial .50 caliber machine gun was located to the left of the cannon in the T124 combination gun mount. The T7 cannon had a relatively low muzzle velocity of 2300 feet per second, but the 95 pound high explosive shell had a powerful demolition effect. Separated ammunition was used as with the 105mm gun in the T29. The cased-propelling charge weighed about 40 pounds: bringing the complete 155mm round weight to approximately 135 pounds. Thirty-four complete rounds were carried, and a spring rammer was provided for use with the heavy separated ammunition. Even prior to the tests, it had been expected that there would be considerable difficulty in handling the heavy ammunition inside the tank turret. On 24 July 1947, the U.S Army authorized the diversion of one T30 for the installation of experimental automatic ramming equipment, an automatic cartridge case ejecting mechanism, and a drive mechanism for indexing the mount for loading and returning the weapon to its previous position. The latter was required because the lack of space inside the turret, combined with the size and weight of the ammunition, permitted the loading of the gun only within a very limited range of elevation. 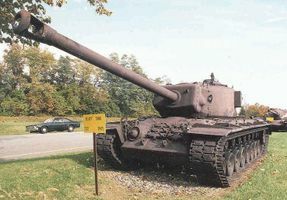 This heavy tank was designated as the T30E1, the weapon and mount as the 155mm gun T7H1, and the combination gun-mount the T124E1. The sequence of operations when the cannon fired in the T30E1 was as follows; 1. The gun fired, recoiled, and returned to the battery position. 2. The gun automatically elevated or depressed to line up with the rammer tray. 3. The rammer-tray was extended. 4. A port in the rear of the turret bustle opened to allow the ejection of the empty case from the turret. 5. The gun breech opened and ejected the empty case. 6. A new projectile and cartridge case were lifted onto the rammer-tray. 7. The projectile and case were rammed and the breech closed. 8. The rammer-tray was withdrawn. 9. The gun automatically elevated or depressed to its original firing position parallel with the gunner's sight. To aid in handling the heavy ammunition, a power lifting device was installed in the T30 and T30E1 during the testing program. From the outside, the only obvious identification point on the T30E1 was the ejection port in the lower rear wall of the turret bustle.